Although Lisa and Jill are the characters of various farming time management games, it seems sometime that they from the same game. These games have so much in common that I will hardly be able to find a great difference between them. 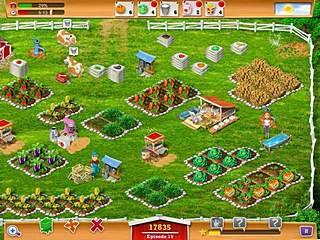 You are offered to play two modes, namely casual and expert mode for My Farm life and correspondingly relaxed and timed mode in Hobby Farm. Both games features 50 levels. The gameplays are extremely similar too. You begin the games by learning the basics. You plant seeds on soil, water them and then once the plant is ready to harvest, you can grab a basket and then click on the fruit to gather it and then deliver it to the barn. You also have to tend to various animals. The main thing is to make sure that they have enough food and water or they won't produce eggs, milk or wool. 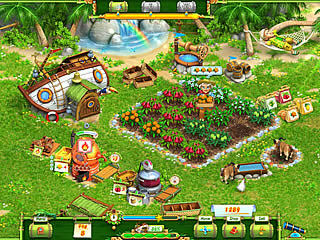 The money you have earned can be invested into new upgrades, machines, seeds and animals for you farm. At this stage everything is simple and the difference is only in kind of fruits, animals and good that could be made in those interesting machine you have purchased. 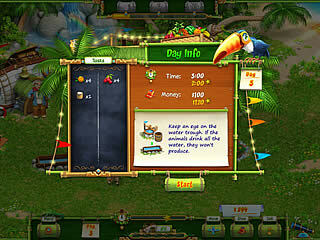 For example in Hobby Farm you can sow java apples, tangerines, pineapples or carambolas or collect shells and coconuts directly form the beach. Make ice from water, jam from tangerines and a delicious drink from goat milk together with java apples. These exotic products could be called this game's features. Every level requires you to fulfill an order for the locals. Every level means every day because again in both My Farm Life and Hobby Farm there is a change between day and night. Animals go to sleep and stop producing during the night and you farm are attacked by night thieves who are trying to steal crops and products. And if in My Farm Life you just chase them away with your flashlight or dogs, in Hobby Farm you are getting stars for scaring thieves away. Stars are your bonuses that could come in handy if you want to speed up Jill or force her husband to help with the farm. Actually with regard to the helper. In Hobby Farm John, Jill's husband, is the only her helper. For the most part, he lays about in a hammock all the day long, while observing Jill and only if you have enough bonuses you could call for his help. Then he will water plants, harvest fruit and plant seeds. In My Farm Life you'll be given with 3 helpers. Calling helpers is tied to your show's rating. The higher your rating, the more skilled the helper is that you may call. 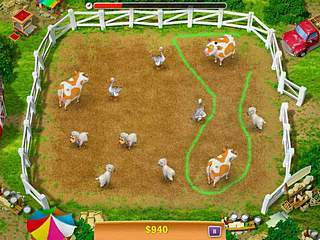 Unlike regular farm life in Hobby Farm, where you do all habitual work every day, in My Farm Life you have a funny and unusual lasso mini game which definitely adds to Farm Life variety and value. One more plus to My Farm Life are its gorgeous graphics, which are without a doubt its strongest feature as opposed to Hobby Farm. To sum up, the well-known farming theme that is used in both games as well as in other ones of this genre may not surprise you, but there are some aforementioned features that might tilt your choice in My Farm Life's favour. Son of a gun, this is so hpleufl! This is Hobby Farm versus My Farm Life review. .